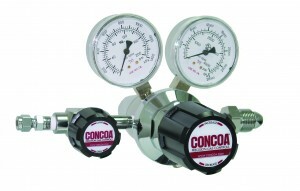 The 300 and 200 series of regulators can be used in several different areas of application depending upon your requirements, with both single and dual stage regulator options, stainless steel,chrome plated brass barstock bodies or chrome plated forged brass bodies, chrome plated die cast zinc bonnets and stainless steel diaphragms. Key Features – Single Stage, Chrome Plated Brass Barstock Body, Four Port Configuration and 316L Stainless Steel Diaphragm. Typical Applications – Gas and liquid chromatography, high purity carrier gases, zero / span / calibration gases, high purity chamber pressurisation, liquefied hydrocarbon gas control and control of cryogenic gases. 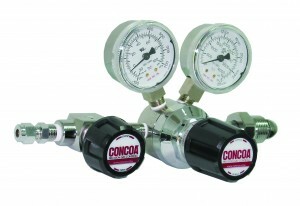 The 302 series regulators are intended for primary pressure control of non-corrosive, high purity or liquified gases or for application where minor fluctuations in outlet pressure due to diminishing inlet supply can be tolerated. Key Features – Single Stage, Chrome Plated Brass Barstock Body, Three Port Configuration and 316L Stainless Steel Diaphragm. Key Features – Dual Stage, Chrome Plated Brass Barstock Body, Four Port Configuration and 316L Stainless Steel Diaphragm. Typical Applications – EPA Protocol gases, gas and liquid chromatography, high purity carrier gases, zero / span / calibration gases and high purity chamber pressurisation. Key Features – Single Stage, 316L Stainless Steel Barstock Body, Three Port Configuration and 316L Stainless Steel Diaphragm. Key Features – Dual Stage, 316L Stainless Steel Barstock Body, Four Port Configuration and 316L Stainless Steel Diaphragm. Key Features – Single Stage, Chrome Plated Brass Barstock Body, Four Port Configuration, Rear Inlet and 316L Stainless Steel Diaphragm. Typical Applications – University Classrooms, University laboratories, Chemical Research and Pharmaceutical Manufacturing. Key Features – Single Stage, 316 Stainless Steel Barstock Body, Four Port Configuration, Rear Inlet and 316L Stainless Steel Diaphragm. Key Features – Single Stage, Chrome Plated Brass Barstock Body, Three Port Configuration, 316L Stainless Steel Diaphragm, Electrically Heated and NEMA 4 Housing. Typical Applications – Chemical storage blanketing, anaerobic chambers, inert gas purging, atomic absorption oxidizer gas, semiconductor reactor furnace, inductively coupled plasma systems and pH control. 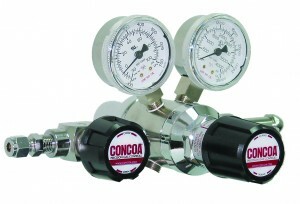 Key Features – Single Stage, Chrome Plated Brass Barstock Body, 316L Stainless Steel Diaphragm and Custom Calibration. Typical Applications – Blood gases, laser gases, medical research, pharmaceutical manufacturing and university laboratories. Key Features – Dual Stage, Chrome Plated Brass Barstock Body, 316L Stainless Steel Diaphragm and Custom Calibration. Key Features – Single Stage, Chrome Plated Forged Brass Body, 316L Stainless Steel Diaphragm and Five Port Configuration. Typical Applications – Gas supply purging, gas system charging, fuel gas supply control, calibration gas control and atomic absorption acetylene. Key Features – Single Stage, Chrome Plated Forged Brass Body, 316L Stainless Steel Diaphragm and Four Port Configuration. Typical Applications – Point of use laboratory systems, gas supply purging, liquefied hydrocarbon gas control, control of cryogenic gases and bulk gas distribution systems. Typical Applications – Argon, Nitrogen, Oxygen, Carbon Dioxide and certain freons. Key Features – Dual Stage, Chrome Plated Brass Barstock Body, Five Port Configuration and 316L Stainless Steel Diaphragm. Typical Applications – Gas supply purging, gas system charging, fuel gas supply control and calibration gas control.